Inma Productions Pty. Ltd. 1981. Director: Ned Lander. 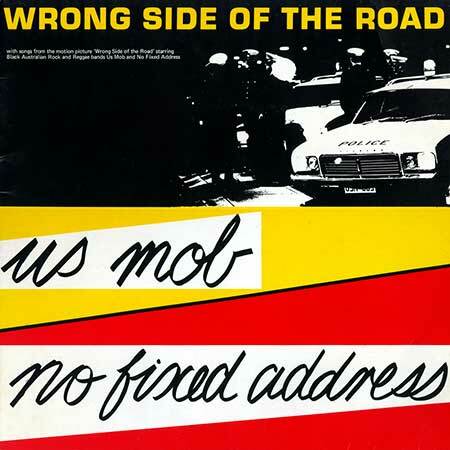 Music: No Fixed Address, Us Mob. LP (ST) Black Australia Records. YPRX-1905. 1981. Produced by Philip Roberts and Graeme Isaac. Music Side 1: No Fixed Address - Les Graham - Lead Guitar. Chris Jones - Guitar/vocals. With Veronica Rankine - Saxophone/harmony vocals. John John Miller - Bass. Bart Willoughby - Drums/vocals/Percussion/Didgeridoo. Music Side 2: Us Mob - Ronnie Ansell - Bass. Wally McArthur - Drums. Carroll Karpany - Guitar. Pedro Butler - Guitar/vocals. Recorded at Grapevine Studios, Adelaide. Engineer: Jim Barber. Mixed at E.M.I. Studio 301. Engineer: Christo. We Have Survived. (3:39). (B. Willoughby). Get A Grip. (2:54). (C. Jones). The Vision. (4:09). (C. Jones). Black Man’s Rights. (3:04). (B. Willoughby). Greenhouse Holiday. (3:06). (B. Willoughby). Genocide. (2:50). (P. Butler & W. McArthur). Wrong Side Of The Road. (2:48). (P. Butler). Suicidal Contemplation. (4:04). (P. Butler & R. Ansell). Tough Living. (3:21). (P. Butler).